Ancient rocks of Medicine Mountain--There are 10 places in the world called "nuclei of continents". These are widely separated places of relatively small patches of ancient rocks, first cooled to the molten earth's crust 2-3 billion years old. Overlying younger rock has worn away. These are thought to be the relatively small nuclei first cooled and built up that grew by volcanic activity and sediment accretion into a single huge island (called Gondwanaland) that began to break up in the Carboniferous era (300,000,000 years ago). They separated, drifting on continental plates of ancient rockbed, into our present continents sometime between 65,000,000 and about 1,000,000 years ago (the continental plates continue to drift). Medicine Mountain is one of these rare ancient continental roots. The cutaway profile shows layers of rock color-coded by age, the youngest lying in the valleys where the Bighorn and Powder Rivers run, and the oldest peaking against the sky, ancient roots down into deepest earth. 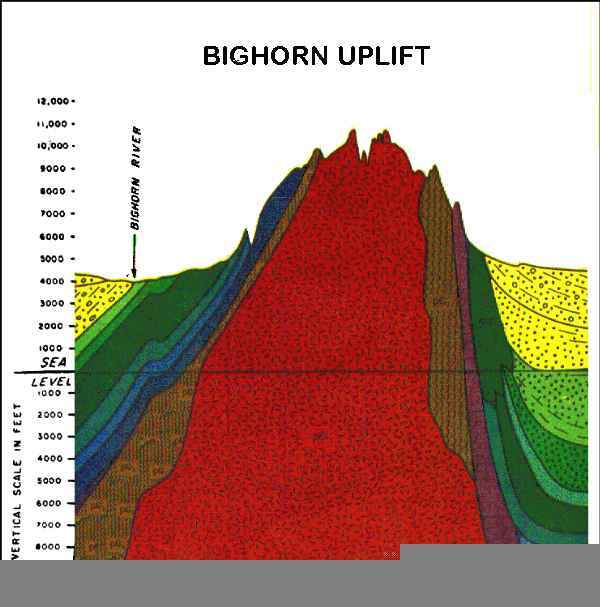 The table below color-codes by time (geological epochs) the rocks in the profile of Medicine Mountain, where the Bighorn Medicine Wheel is located on a high shoulder near the peaks. It gives an approximate range in long-ago years of geological and evolutionary time, and shows what was happening to life during the billions of years of this immensely long period. Take another look at the way the epochs of rock-time layer over that ancient peak. The other continental roots don't show this neat reverse epochal order of layers, or even layers for all epochs. The other continental nuclei are elevated outcroppings of the oldest Pre-Cambrian rocks, interspersed in jumbled fashion with newer ones. 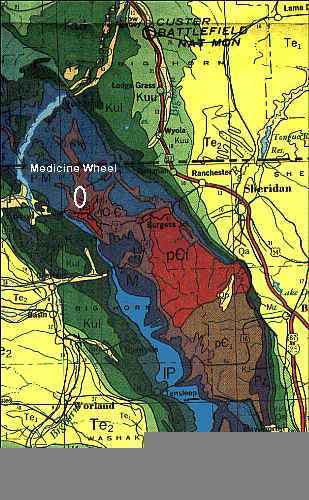 The Medicine Wheel (white circle) looks from the shoulder of the most ancient times down surrounding precipices (that give it nearly a 360° horizon view) to slopes that get progressively more "modern" until in the valleys on either side are sedimentary rocks deposited in merely the last million to few hundred thousand years. Along the range's spine, this character of most ancient age exposed to the sky is not maintained very far north or south of the Wheel, although the physical appearance of the mountains is the same. Thus the Medicine Wheel floats on a high island of time, the world's oldest rocks, layered in reverse order of the epochs of geological history. The other continental roots are in Yellow Knife province and a place on the Canadian Shield north of Lake Superior; the Guyana Highland in South America; the Dnieper Plateau in central Europe; Dharwar province in southern India; Guinea, Tanganyika and Rhodesian highlands in Africa; and Southwestern Australia. In none of these other continental root nuclei is there a neat folding-and-wearing of the rock layers in an ordered set peaking by age, such as is found in the Bighorns. Medicine Mountain is a very special place, where the whole geological history of the earth is layered, with the most ancient rocks of all on the peaks, layered through time downhill to the modern valleys where people live. Perhaps this was felt somehow by those who built the Wheel there many centuries ago. I have a piece of it, that geology. I got it the morning of the 1978 solstice sunrise I'd waited all night for by the Wheel on Medicine Mountain. With the sun full up, I was wandering around joyful (and hungry) watching the colors change on the land below as the sun rose higher and the last few scraps of cloud just vanished to nothing. Suddenly a man and a woman were walking there -- very ordinary they looked, maybe they were dressed for chilly dawn high mountain hiking. Except that I couldn't look at their faces, my eyes slid away, the faces were just blurs. They didn't seem to have come from anywhere but maybe I missed it somehow. The tall man stayed in the background, never said anything. "We're here taking care of the trees," the woman said. This -- at the time -- didn't seem at all odd (though it's well above the tree line, and that isn't a very typical early morning greeting). In retrospect, I wonder at myself, feeling so everyday about it. "Did you know that all of this was once under the sea?" she asked. I told her I really knew very little about it, not even why I'd come. She told me I would soon learn more about this. "Here are two fossils from that time," she said, holding out one in each hand. "I want you to choose which you'd like to have." I looked carefullly at each of them. Both were the same light golden sandstone that the boulders of the Wheel are made of, scattered smallish pieces of this are -- or used to be -- all over the area. In one was the fossil impression of what seemed to be a beautiful, delicate fern. In the other, the spiral of the now stone mudcast left by a snail when its body had decayed inside the shell buried in ancient mud and sand. I really wanted the fern, it was so perfect, so beautiful, more like a work of art than a time-artistry fossil. But, just because the fern seemed the better of the two -- probably she wanted it herself -- I chose the snail. "This will help you slow down as you're going around and around again, like that old snail," she said. I thanked both of them, said I would go down and get something to eat, then I was going to visit a friend on the Northern Cheyenne reservation. She told me not to eat until I had seen an unusual snake. Maybe I looked away or something; both were gone without goodbye. There seemed no place they could have gone to, it was pretty barren up there. I have to say I'm a very matter-of-fact type of person. None of this seemed in any way strange, odd or "spiritual" to me. They were just a couple of people up on a lonely, barren mountain at dawn, there taking care of trees, one of whom gave me an old fossil and said some things that only seemed strange some time later. I don't think I met "a couple of spirits," I think it was a couple of people hiking around up there just after dawn, but I can't explain what she said to me or why I couldn't look at their faces. Nor did I see any vehicle or campsite hiking to my car and on down the rough former travois-trail road -- because by then it was beginning to strike me as a bit strange, so I looked for signs of them. As for the fossil snail, it's wrapped up in my medicine bag that I'd gotten from where my grandma left it for me the year before. As for the unusual snake, I saw it at the Custer Battlefield Monument where (since it was nearly on my way to the Northern Cheyenne rez) I'd stopped to check it out. What I saw on the grass by a path to some monument I never reached was apparently the stiff, hollow, 3-dimensional transparent shed skin of a snake, who must have wiggled out through his own jaws, where some shreds looked like fangs in the gaping mouth, the modeled head with eyeholes. There were translucent models of scales all over him, a hollow rattle on his curving tail. Definitely seemed unusual, I'd never seen a shed snakeskin before (or since) but I thought they left the skins pretty shredded getting out of them. This fellow, except for the gaping, ragged jaws, was quite whole. Maybe that's common, but to me that was an unusual snake...so I could soon get something to eat! "Nyyyyahh! Mine! I found it!" he said nastily. Both pudgy parents smiled approvingly at his enterprise, frowned at me, little eyes sunk in piggy faces. But I hadn't wanted to touch it, and as I walked away -- never did see any actual monuments or inscriptions, I left that place immediately -- I saw him breaking it, that strange casting, the hollow life-sculpture of a small rattler. I felt kind of sorry for that fat, greedy little family. I had really wanted the unusual thing -- how useful for a science class! -- but I knew I should not touch it. They enabled me to break my fascination and go away from it. I sometimes wonder if anything happened to those fat, greedy, insolent, disrespectful people. I feel sure something did, and yet I wonder. It was like a miniature lesson in white greed, disrespect, hostility and grabbiness. Perhaps that fat kid now brings his own fat family up there to the Wheel among 30,000 others like him. If so, undoubtedly, they're obnoxious, no respect, leave plenty litter, break and take. At that time, the Custer monument was strictly to Gen. Custer and the brave white soldiers who died there, there was nothing for the fallen Indians, and nothing of the real history of the event as I'd heard about it previously (that's changed some now, I hear). Greed for land, greed for falsifying and (whatever the truth) telling history their way, greed for sacred (and possibly dangerous) places, things, ceremonies, knowledge -- does anything bad really ever happen to those who live that way? The large answer of history is No, it doesn't, usually. Probably nothing happened to that obnoxious little tourist family too. Snake grabbers, snake breakers, fat and mean -- I'll never know. As for learning more of the site's ancient geology, I tried to do that when I came back, from library visits. But where I learned the most and the most quickly was from a map I received a few days after I'd got back, from a friendly mathematician who was employed by the Bureau of Mines of the U.S. Department of the Internior. He knew I'd been researching coal and water diversion plans in the Powder River country that affected the Northern Cheyenne and Crow reservations, the Lakota 1868 Treaty Article 16 Powder River country lands, and other Indian rights. He thought that map might be helpful. It was. Though it's now so dog-eared all its folds are worn nearly through 20 years later I scanned some little sections of it for this article. But you can now buy that same map today (from Carolina Biological Supply 800/334-5551, catalog number GEO 8954, $8.60) if you're curious about the geo-history of Medicine Mountain. How old is it, my coiled fossil snail? I'd like to think 425 million years, the Cambrian-Ordovician when molluscs began to spread -- but although that was a period of subsidance in that area, only mud and sand were being deposited on the lake or sea floor in that epoch. Besides, the coiled gastropod is probably a much later type of critter. The fossil looks something like those that are found in the Paleozoic-Permian layers at Grand Canyon, a mere 230,000,000 years ago. That's geologically consistent, the Bighorns area was subsiding, and its limestone layers were being deposited by billions of little shelled sea animals. Other than guesses, based on fossils from old rocks found elsewhere, I don't know. Somehow I never got around to showing it to an expert. I've never shown it to anybody. It's always stayed wrapped up, except occasionally I unwrap and look at it -- another sort of wheel, a once-living spiral of the ancient life which made many layers of the rocks of that ancient place, now a high mountain, then a low sea. CREDITS: Geological maps and rocks diagram from "Geological Highway Map: Northern Rocky Mountain Region," American Association of Petroleum Geologists. Geological epochs table data from The Earth Sciences, A. Strahler, Harper Geoscience Series, NY: 1963.